100 l/min, 0.5 µm, 1.0 µm, 3.0 µm and 5.0 µm; Reports to EU GMP, ISO 14644-1 and FDA standards; Colour touchscreen navigation menu; USB flash drive and Ethernet connectivity; Exhaust port for return of tested air to sample area. Meets or exceeds ISO-21501-4. 1.0 cfm (28.3 l/min), 0.3 µm, 0.5 µm, 1.0 µm and 5.0 µm; Reports to EU GMP, ISO 14644-1 and FDA standards; Colour touchscreen navigation menu; USB flash drive and Ethernet connectivity; Exhaust port for return of tested air to sample area. Meets or exceeds ISO-21501-4. 0.5 µm and 5.0 µm, 1.0 cfm (28.3 l/min); Built-in Air Source; Choice of Ethernet/4-20mA Connectivity; Meets or exceeds ISO-21501-4. 0.5 µm and 5.0 µm, 1.0 cfm (28.3 l/min); Choice of RS-485 / 4-20mA Connectivity; requires vacuum supply; Meets or exceeds ISO-21501-4. 50 l/min, 0.3 µm, 0.5 µm, 1.0 µm and 5.0 µm; Reports to EU GMP, ISO 14644-1 and FDA standards; Colour touchscreen navigation menu; USB flash drive and Ethernet connectivity; Exhaust port for return of tested air to sample area. Meets or exceeds ISO-21501-4. 75 l/min, 0.3 µm, 0.5 µm, 1.0 µm and 5.0 µm; Reports to EU GMP, ISO 14644-1 and FDA standards; Colour touchscreen navigation menu; USB flash drive and Ethernet connectivity; Exhaust port for return of tested air to sample area. Meets or exceeds ISO-21501-4. For collection of data from CLiMET Portable Particle Counters. Includes CLiMET ID Pro. Generates a variety of standard reports defined by industry standards, such as EU GMP Annex 1 and ISO 14644-1, as well as graphs for trend analysis. Complies with all applicable FDA 21 CFR Part 11 requirements. 0.5 µm and 5.0 µm, 1.0 cfm (28.3 l/min) Airborne Particle Counter. 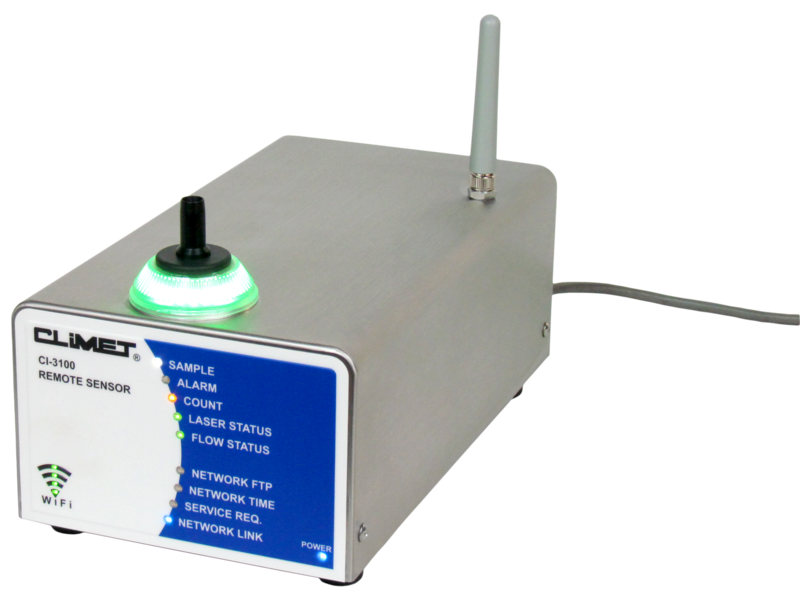 The New Trident Series™ of Particle Counters provides a Sample Data Memory Buffer, an optional RH & Temp Probe, and is the industry's first to provide Power over Ethernet (PoE+) in a Particle Counter with an integrated vacuum pump. 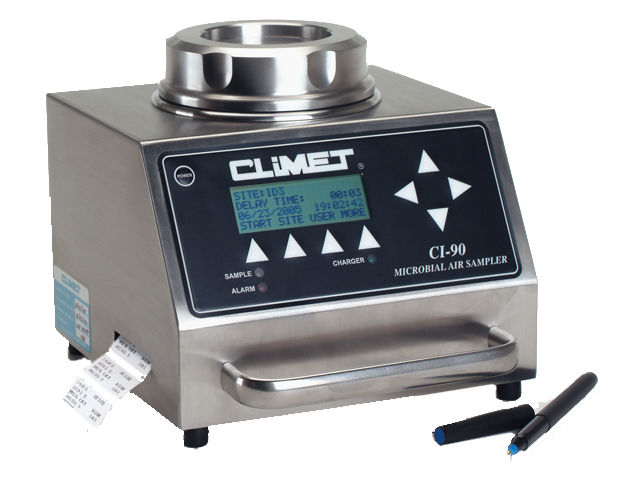 Download software for CLiMET Particle Counters available as Excel Macro for Windows in both standard (£175.00 ex VAT) and FDA 21 CFR Part 11 compliant format (£650.00 ex VAT). High quality, 316 stainless steel isokinetic probes, available in four flow rate sizes: 1.0 cfm (28.3 l/min), 50 l/min, 75 l/min and 100 l/min from £285.00, dependent upon flow rate. Designed so that a cross-section of air is drawn in with minimal turbulence, ensuring that a representative sample is obtained. 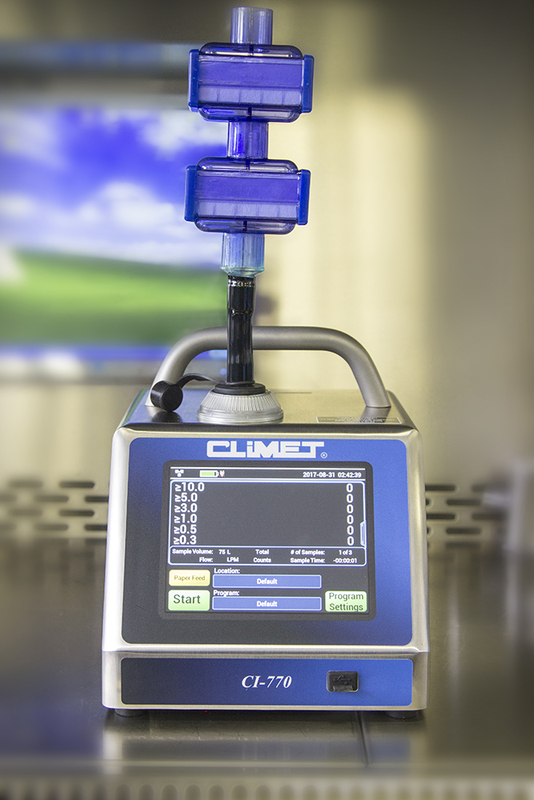 For use only with CLiMET particle counters when sampling without tubing. Available in flow rates of 1.0 cfm (28.3 l/min), 50 l/min, 75 l/min and 100 l/min.